Katy oversees prevention programming, communication, and assessment for CMHC. She plans, develops and implements innovative public health programming and forges campus partnerships to support mental health promotion, suicide prevention and interpersonal violence prevention. She also oversees the Public Information Team (PIT), a team of professionals dedicated to ensuring that CMHC’s services are appropriate and effectively communicated to the UT community. 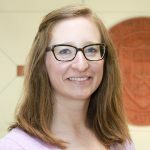 Katy’s professional interests include health communication, public health methods to improve mental health, social justice and health equity. In her free time, Katy enjoys running, hiking, traveling, quilting, calligraphy and watching her young children experience the world. Disclosure: Kathryn Redd has no relevant financial relationship(s), potential or perceived, with commercial or conflicts of interest to disclose.